Our R & D department has developed some special treatments making available a fibre whose specific performances are tailored upon demands and uses. Antibacterial protection built into the fibre during manufacture. The special treatment to which the fibre is submitted, avoid that both oil and grease removed from any working surface enter inside the fibre. 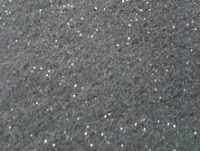 During the production process, special glitters are added to this fibre for a sparkling visual impact.